Action is needed to prevent Eastern Europeans, particularly Polish people, who come to Britain from becoming destitute, a homeless charity said. Homeless Link found around 15% of the 4,356 people surveyed in day centres and night shelters over one week in London were from Eastern Europe. The group said most people needed only short-term help, but charities were not equipped to meet their needs. Janusz Vaah, the Polish consul general, agreed they were struggling to cope. 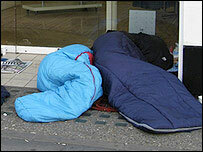 Jenny Edwards, head of Homeless Link, said not enough action was being taken. She told the BBC's Today programme: "Nobody at the moment is doing enough to help the people. "They're turning up in homelessness services and it's not where they should be. "They're people who have come here wanting to work and the main thing they want to do is to find out how to get a job and a roof over their heads." The survey concluded that, while most Eastern Europeans who came to the UK had found work and accommodation, some were homeless. During the week of the survey, 638 people from Eastern Europe, otherwise referred to as nationals from the A8 accession countries, were counted by homeless agencies in the capital. The majority of the people seeking help were from Poland. Mr Vaah said: "This is a new phenomenon, not only for the officials of the UK but also for the Polish government, dealing with a group of homeless nationals abroad and the expectations of that group. "The expectations are far more bigger than what we can offer in our services, so we are trying to make both ends meet and work out something that will help those individuals for the time being."